Tuesday night, after work, on my way to pick up Madeline from daycare, I found myself in tears. I’m sure I’ve mentioned before that I have to pass two cemeteries on my way home each day. The cemetery where my Joshua is buried and the cemetery where my Grandma Jones is buried (along with my Grandpa and cousin). Most days I have to really just focus on the road, staring straight ahead, and refusing to let my gaze linger over where I know they are. It takes a lot to not want to stop every day and just linger. So on Tuesday, I let my eyes drift over to where I knew they were and the tears fell hard. These days, I’m mostly good. I usually have a moment or two that nearly breaks me each day, but I am generally able to hold it together. Then there are days like Tuesday. Days where the weight of the loss is just far too much to bear and the grief washes over me and I find myself torn between a state of shock that this is really a part of my life and just complete devastation that this is part of my life. Grief is such a strange thing. It is constantly changing shape and form. Some days it is easy to push aside and other days it comes at me with hurricane force winds and knocks me down. I changed the channel on the radio. Maybe a change of song would help hurry this grief storm along. I was nearly to Madeline’s daycare now. I really needed to pull myself together. I couldn’t very well go inside with tears running down my face. Right there in the middle of the street. 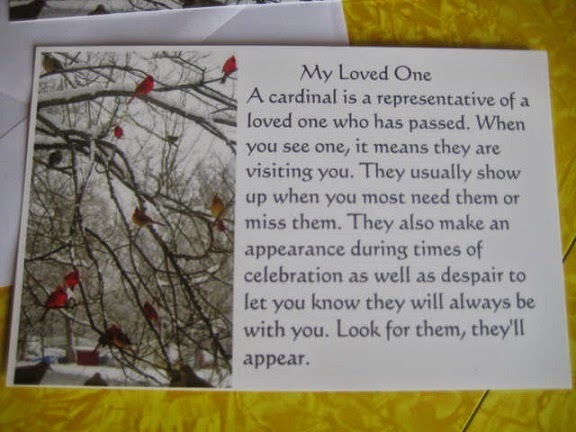 It’s been awhile since I’ve talked about signs from Joshua, but Tuesday, that cardinal, that was him. I just know it. Previous postMadeline’s First Trip to the Zoo!